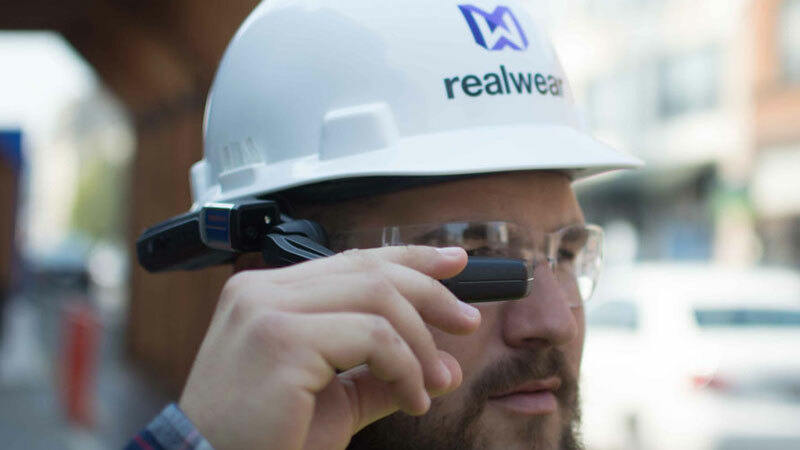 Your device is already configured to keep its operating system up to date via over-the-air (OTA) updates distributed by RealWear. 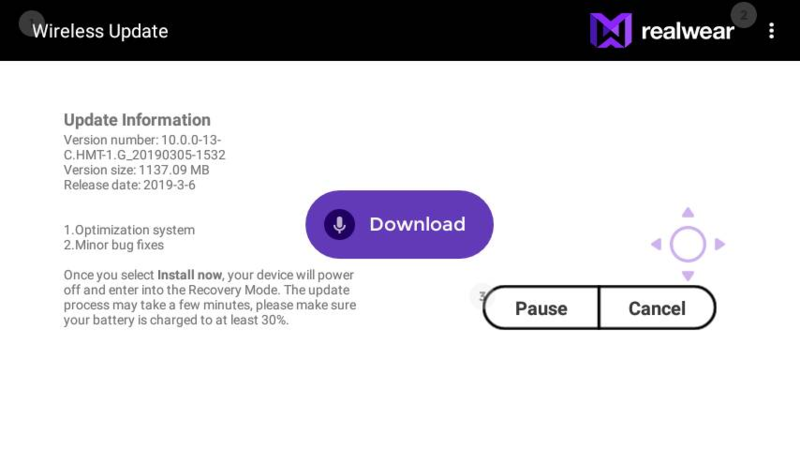 The HMT will not update automatically, it requires a user to launch the update. 1. Power ON the HMT-1 and connect to a Wi-Fi network. 2. 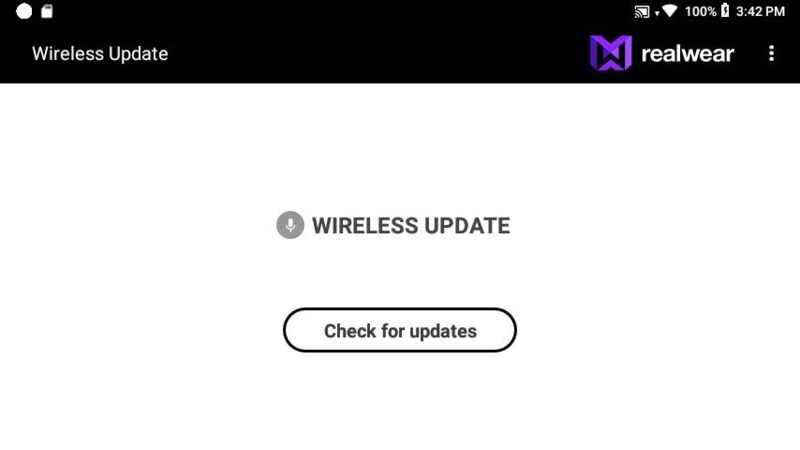 Navigate to My Programs and say “WIRELESS UPDATE”. 3. An update may already have downloaded. If not, you may say “CHECK FOR UPDATES”. 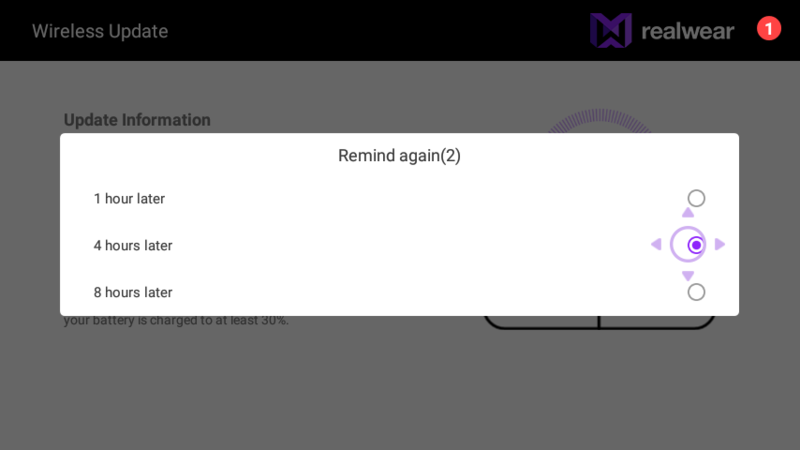 A message will display if you’re up to date. 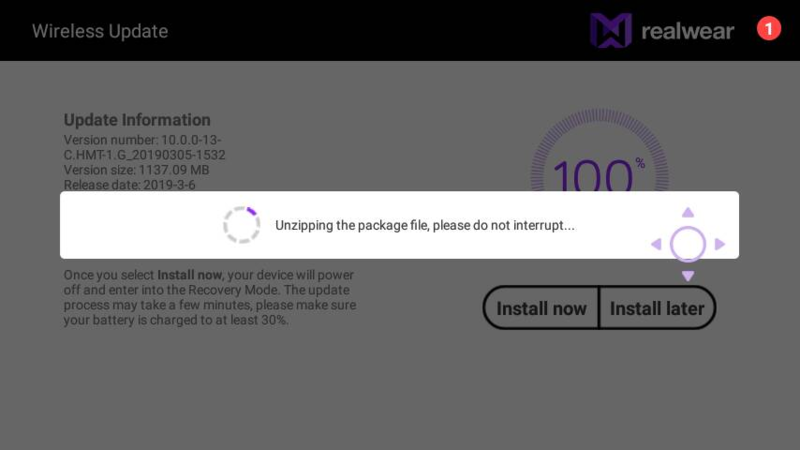 If there is an available update, an option to download the package is displayed. 4. Say “DOWNLOAD” or say “SELECT ITEM (followed by the item number)”. 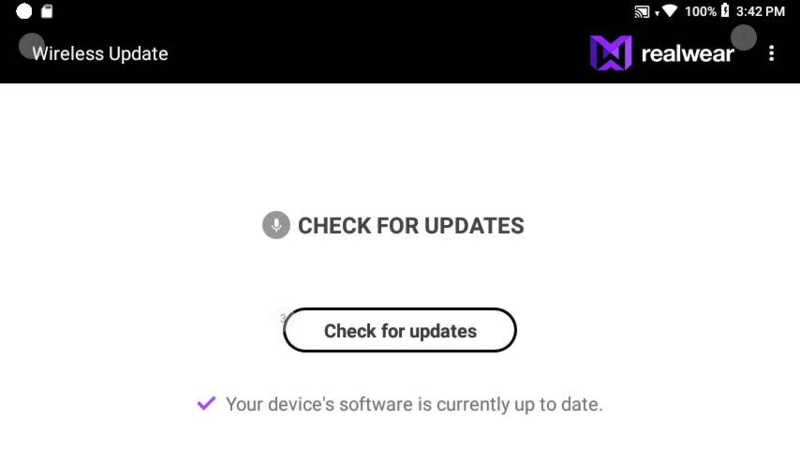 The software update download will start. The download time depends on the size of the package and the network connectivity. We recommend muting the microphones if the the download is large. Just say “MUTE MICROPHONE”. When the download has finished, briefly press the large black Action Button on the boom-side of the HMT-1 housing. Then you can install the update via voice commands. 5. 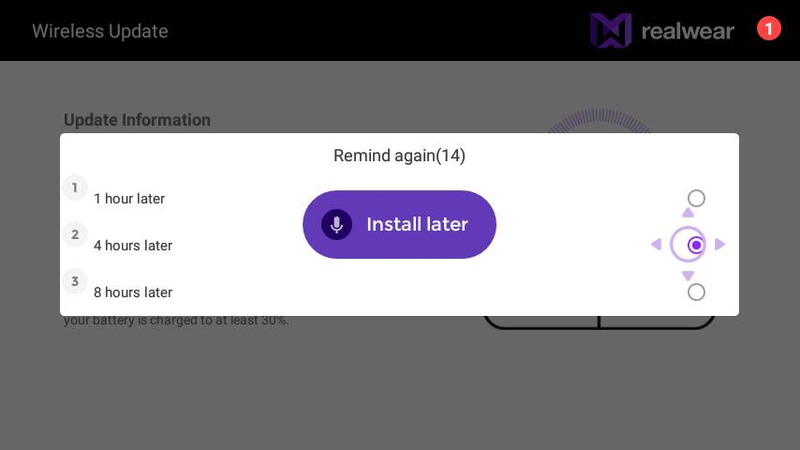 Once the download is complete, an option to install now or later is displayed. 6. 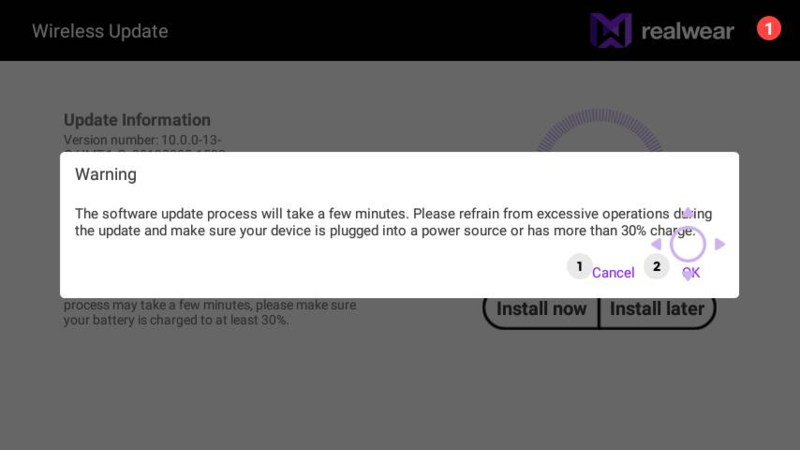 If you say “INSTALL LATER”, a pop-up to set the installation delay time is displayed for about 15 seconds. You can set the installation delay time to by 1, 4 or 8 hours. If the delay time is not set within the given time, the default delay timer is set to 4 hours. 7. Say “INSTALL NOW” to install and update the HMT-1 software immediately. Say “OK” to proceed with the update. The HMT will reboot itself upon completion of the update.